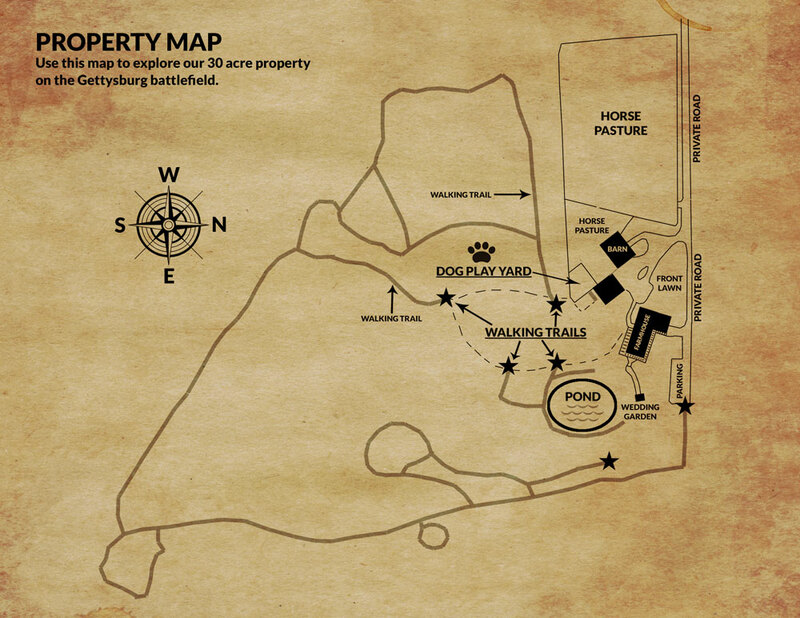 General information about the inn, wedding venues, and innkeepers, the history of the 1809 Civil War Farmhouse and 1820 Civil War era barn wedding venue. We delight in helping our guests explore apple-harvest in Adams County. We can direct you to skiing at Liberty Mountain once the temperatures drop. We can tell you our favorite shopping spots for holiday hand-crafted treasures. Your innkeepers are the key to local information whatever your interest. Connie, Florence and Debbie sporting 80’s costumes for the B&B’s annual New Year’s Eve murder mystery dinner party. Innkeepers Florence, Debbie and Connie Welcome You! Family is important of us. With two adult children each and five grandchildren between Debbie and Florence, we know how important it is to build a place where families can come to build memories and celebrate together. Florence planting pumpkin seeds in the vegetable garden with her granddaughter Alice. Florence March has been innkeeping since 1994. She loves music, teaching, cooking, and gardening. In a world long ago and far away, she studied geology and worked in a science lab analyzing meteorites while looking for signs of life in outer space. While raising children, she trained as a music docent and taught elementary music in the California public schools. I'm excited about the garden this year. We are expanding our herb garden and starting a new, larger vegetable garden. I like to plant flowers to feed butterflies and bees. Debbie working on the wedding show booth in the barn while granddaughter Parker climbs behind her. Debbie March started as the Event Coordinator in 2011. She has a passion for teaching and healing arts. Debbie is a real native of Gettysburg. Her family arrived in the Gettysburg/Hanover area in 1752 from Hanover, Germany. She is a direct decendant of the Wolff/Wolfe family that owned the farm that was the site of Camp Letterman, the tent evacuation hospital created for the wounded after the Battle of Gettysburg. Her family traded horses with both the Union and Confederate soldiers as they passed through her family farm. She has local stories to tell! When Debbie isn't training her dogs Vince and Sassy, she loves reading about Henry VIII's wives. Well, maybe she doesn't speak Pennsylvania Dutch all the time. Her careers have spanned insurance, real estate, managing a pediatric office, and teaching medical classes at a career college. She never dreamed that she would be planning weddings. Life is full of surprises! Debbie would say in Pennsylvania Dutch, "Come help me throw the horses over the fence some hay!" Constance Tarbox is Florence’s daughter and Debbie’s step-daughter. After creating theater in New York City for over 20 years, she moved back home in 2017 to re-join the family business. She loves getting to know our wonderful guests and bringing her producing experience to the B&B’s special events. A California native, Connie was in high school when the family decided to move to Gettysburg and open the B&B. 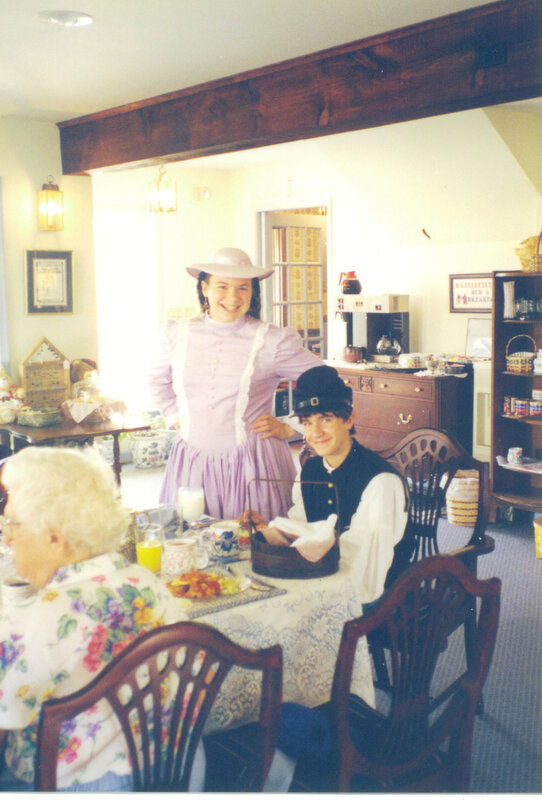 Her summers and weekends were spent in her Civil War dress, serving breakfast at the B&B. She moved to New York to attend Barnard College. She met wonderful friends and created beautiful art with them. One of these productions introduced her to Lance Windish, a genius performer with whom she fell in love. Connie and Lance were married at the B&B in 2006, the first wedding in the newly updated barn. Connie and Lance have two wonderful daughters, Parker and Alice. They frequently make appearances at the B&B, helping to bake cookies, tend the garden, and herd cats. Let us be your home away from home. Welcome!